Craft: This image was created with using only photoshop brushes. I created layers for each different part of the image. The first layer was the black background with the textured brush colored green. I used the some textured brush for the cover of the book, but changed its hue from green to light brown. The swirl that come up over the book was created in another photoshop document to be turned into a brush. I did this by opening a new document in photoshop that was 2500 x 2500 pixels with a resolution of 300, and making sure it was set to gray scale. I import my image and use the eraser tool to trim up the sides, and once complete I turn it into a brush. To do this I go to Edit and define brushes, then I titled my brush Magic_1 and saved it to my photoshop brushed. Once the brush was saved, I returned to the document above and used the brush I created to make the book look surrounded. Concept: The concept of this image it to show the dark magic that is incorporated with this book. The book is as sketch of the "Book of Spells" that is shown in the Hocus Pocus movie. 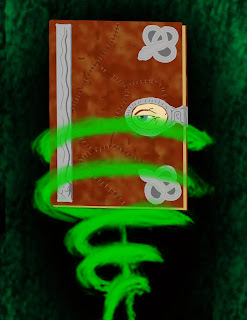 I wanted to use a green swirl because when the book was opened in the movie a blast of green light the emanates from the inside of the book that can only be seen by the witches, so I wanted to show that same light that is in a smokey form lifting the book into the air. Composition: This image is composed of many different layers have different kinds of brushes used to create the sense of the magic book from Hocus Pocus. There are regular brushed that are used to compose the snakes on the corners, the eyeball and its latch, and the snake on the spine of the book. It is also composed of some vector brushes that give a textured look to the cover of the spell book.